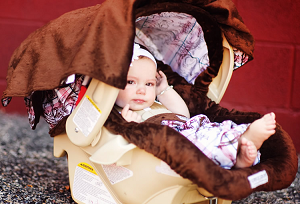 Carseat Canopy is giving away free $49.95 baby carseat canopies (while supplies last). Doesn't there always seem to be another new baby to buy for? What a great baby shower or gift idea! The bold, fresh styling of these canopies is awesome! Order your new free car seat canopy from Carseat Canopy ($50 value!) today - or - get $50 off The Whole Caboodle 5 piece set. 1. Click on “Shop Now”, select any canopy you would like. 2. Once you have selected your Free Carseat Canopy, you will automatically be directed to the “Shopping Bag” where you can enter this promo code “BABYSAVINGS”. NOTE: You CAN use the code more than once – you just have to open a new browser/window to do so. Due to its nature, this offer can’t last long - so please hurry. Click for your free Carseat Canopy today!